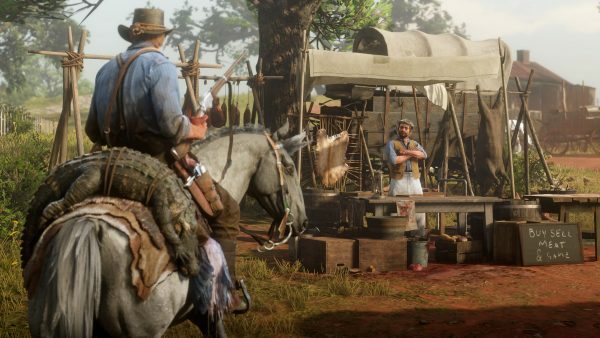 You’ll be spending a lot of time with your camp in Red Dead Redemption 2, and your gang members will expect you to contribute your share. There are four ways of helping out around camp. You can help by delivering game and pelts you collect when out hunting, you can share cash from completed jobs, you can increase medicine stocks, and you can hand over ammunition. Handing over cash is as simple as walking to the cash box and choosing the option to share money. Select the amount and you’re away. You can also deposit high-value items, like gold bars, that will add some extra cash to the piggy bank. In regards to hunted game, you simply bring your animal carcass to camp on your horse, hitch your horse by the hitching posts, then head to the cook and hand the provisions over from the options menu. You don’t need to physically take it over to the cooking area like you do in the opening sequence. You can check out our guide on how to upgrade your camp, as well as how to upgrade your satchel to carry more of that sweet loot. Medicine and ammo aren’t quite as obvious, however. To contribute these, you must open the ledger which is located beside the cash box. From there, choose an upgrade for your ammo and medicine stocks to get better goods from them. There’s also an option to replenish the stocks in exchange for cash – choose those to get your ammo and medicine indicators out of the red. The post How to get ammo and medicine for your camp in Red Dead Redemption 2 appeared first on VG247.